Have you seen such cuteness on a phone?? My best friend came over this past weekend to spend girl time with me, and in that time she introduced me to the world of customized phone backgrounds and icons. Like seriously, where have I been?? 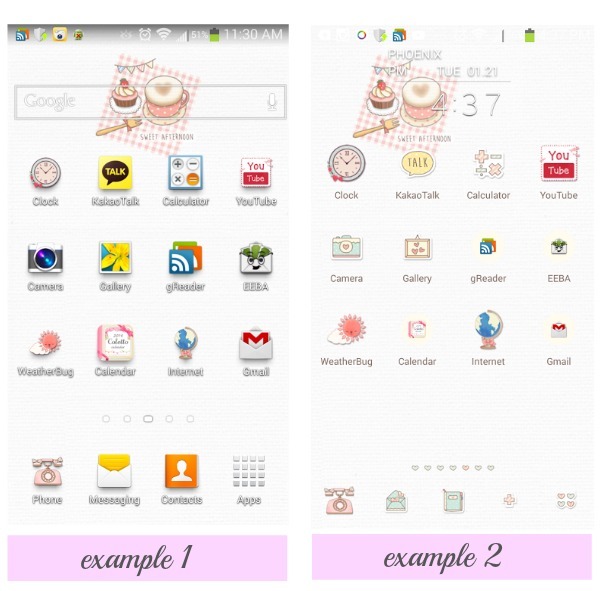 It totally didn't occur to me to look up customized phone apps until I saw it on hers. This process was so easy and simple to use: I just went to the google app store, downloaded dodol launcher, and then browsed through the many dodol themes in the market. I came across so many cute ones until finally deciding on just one, which was this Sweet Afternoon theme. I downloaded it, opened the app and immediately starting rearranging my screens and getting more personalized icons to match. 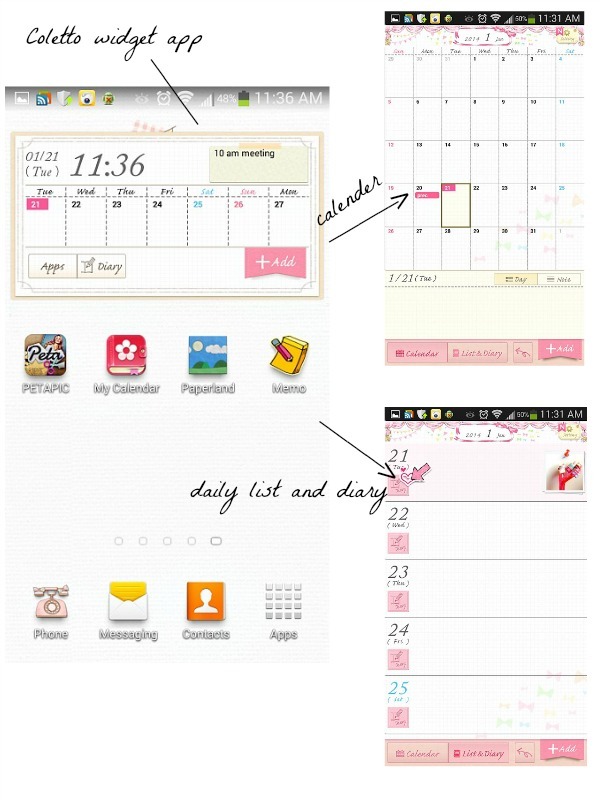 Icoron is a good app to find customized icons for your phone as it's free and offers such great variety. I used this for a few of the icons that didn't come with the Sweet Afternoon theme. I also fell in love with the designs on the Sweet Icon Change Strawberry Box app, which you can see pictured below in ex. 1 and 2 for my "clock, weather bug, youtube, phone," and "internet" button. Some days when the icons are just a little too much for me in example 2, I have the option to always switch back to my standard icons pictured in example 1 by using the original TouchWiz Home screen. On my other screen I have my handy dandy Coletto calender which is used to set alerts and daily reminders for meetings, errands, lunch dates with the girlfriends, etc. Here are a few screenshots of the widget app I set up that opens up into a quick view calender and then into a daily dairy log. Oh, and before I was introduced to the dodol themes, I was using Paperland, as you can see by the icon pictured above. It's a live wallpaper that has a cute storyboard like feel to it. Download it. It's so cool and creative! Surprisingly it doesn't drain much of my battery power, but then again, I do use a task manager and a screen filter to help preserve the battery life. And to make things even prettier, there's an app that can be downloaded to change the android keyboard appearance. 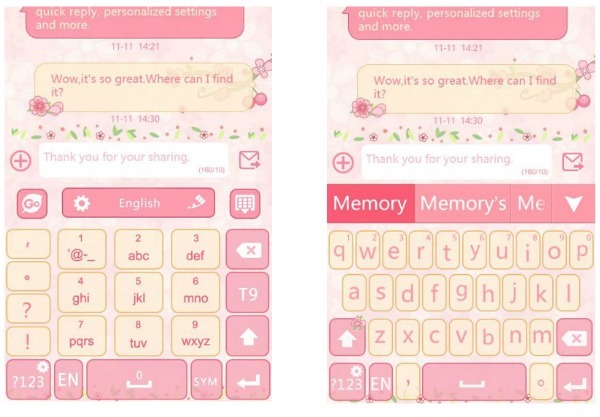 My best friend uses and recommends GO Keyboard, and she uses the Lovepetal theme. Although she loves it, I was a little hesitant when the option button popped up notifying that personal data, texts, and credit card numbers may be collected. So, I skipped this app and stuck to my original keyboard. And that concludes my new customized phone screen and icon post. If you're interested in seeing more cute themes, I went overboard and downloaded 7 more! Isn't it so cute? I just love all the different theme options. OMG! OMG! These are so cute!!! I'm definitely downloading this app!! This is cute! It really fits a young girl’s personality. I especially like the typepad. The pinks and yellows blend well together. I also love the look of the icons, how they appear like little drawings.